The holiday season is in full swing and many of us will be spending time in the kitchen making our favorite desserts and dinners. 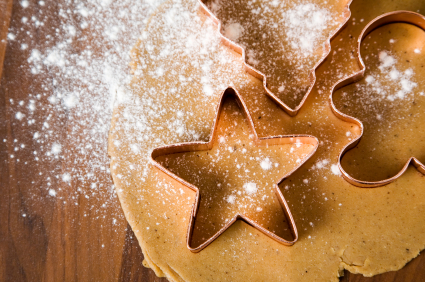 Here are a few tips and tricks to help modify your favorite recipes to add nutrition and cut down on some of the added sugars and fats that the holiday season is known for. Whole wheat flour is an easy way to increase nutrition. Use white whole wheat flour for baking, since it’s a bit softer than regular wheat flour. Not sure about the substitution? If you’ve never tried baking with whole wheat flour, start by replacing ½ of the flour called for with whole wheat, keeping the other half all-purpose flour. Most recipes really don’t need as much sugar as they call for. Before cutting out sugar all together remember: sugar does more than just sweeten a recipe, it also helps with moisture, texture, and browning. Try reducing the amount of sugar in a baked good a little bit at a time and as a general rule, always keep half the amount of sugar called for in the original recipe. If the recipe already calls for fruit, try adding a little more to off-set decreasing the amount of added sugar. Try replacing some of the saturated fat (the butter or shortening) with unsaturated fats (like olive or canola oil). This principle may take a little experimentation and won’t work for all baked goods. If the recipe only calls for oil, try substituting 1/3 cup of applesauce for a ½ cup of oil. This typically works best in muffins and sweet breads, not so much for cookies. Think about the proportionality of ingredients in the recipe, many mixed dishes are heavy on the grain carbohydrates and can always use more vegetables. Experiment with different herbs and spices to add flavor and depth to recipes versus sodium. This article is great. It will really help to avoid eating all these fatty and high – calories food that result in weight gain or body fat storage. I really liked the information about the role of sugar in food, it is often misunderstood by people that sugar only sweeten the food. It is very much true it adds a lot to the dish. Well written article.